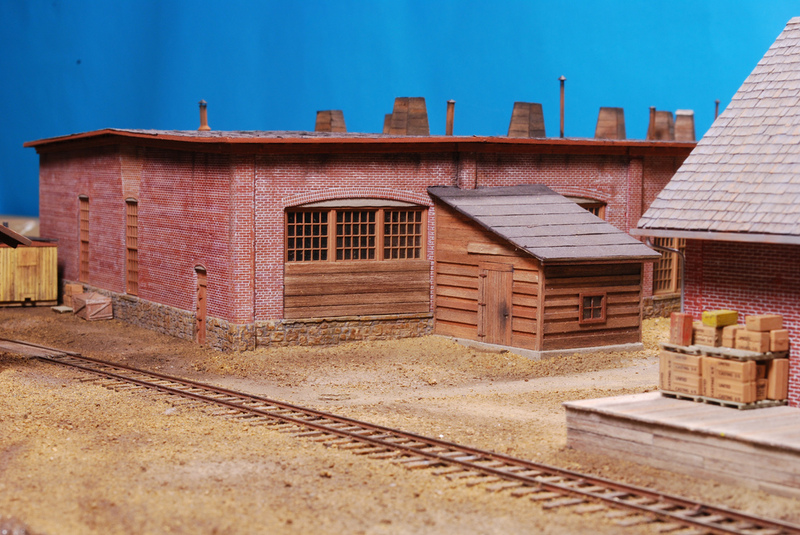 The Ridgway Roundhouse was released as my first limited run kit in 1994. Only 135 kits were produced. This followed by its companion The Brick Office Building which also sold out years ago. 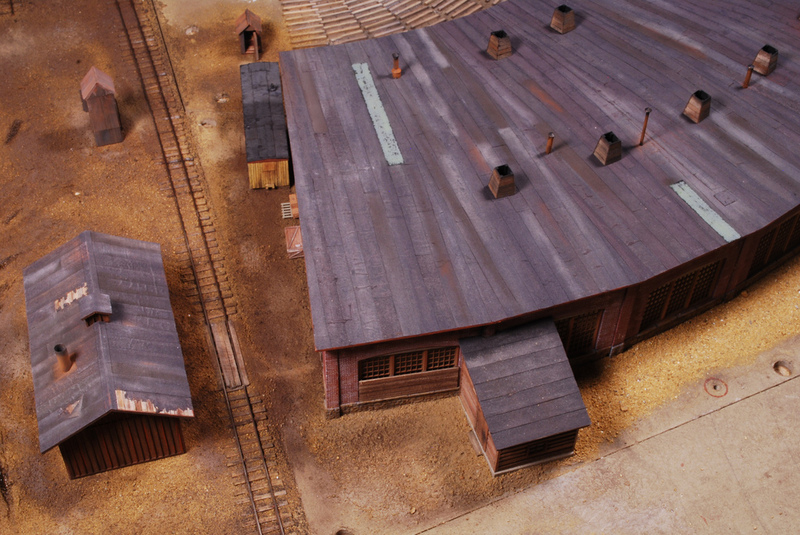 The models faithfully depicted the prototype with five stalls plus two addtional stalls added for the famous Galloping Geese. The office was always one of my favorites with its cast Hydrocal cedar shake roof that fit together perfectly. Just stain and weather. It also featured some of my first white metal castings for the correct doors and windows. The masonry walls were carefully rendered with my original hand-scribed brick. I even modeled the cracks! Concrete inspection pits were included. 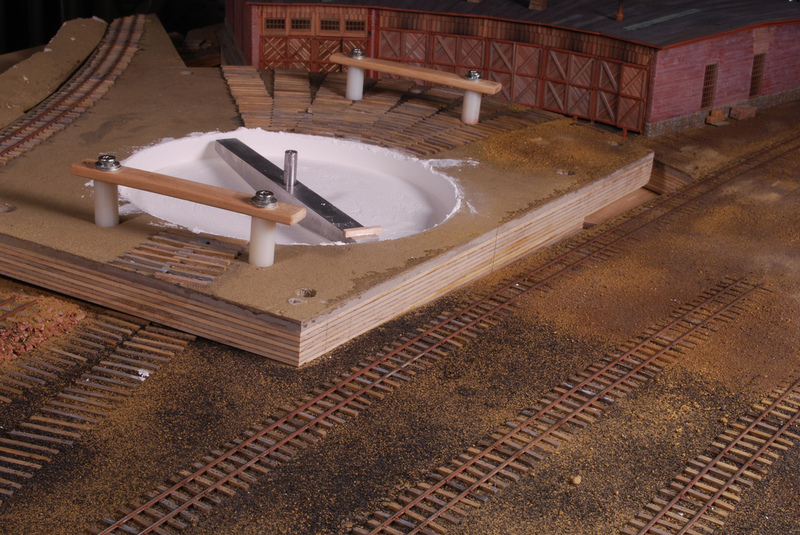 The roundhouse windows were Grandt Line and the engine doors constructed with styrene over full-size templates. Jumping forward 20 plus years I'm making a second run of the kits offering them as a complete set. 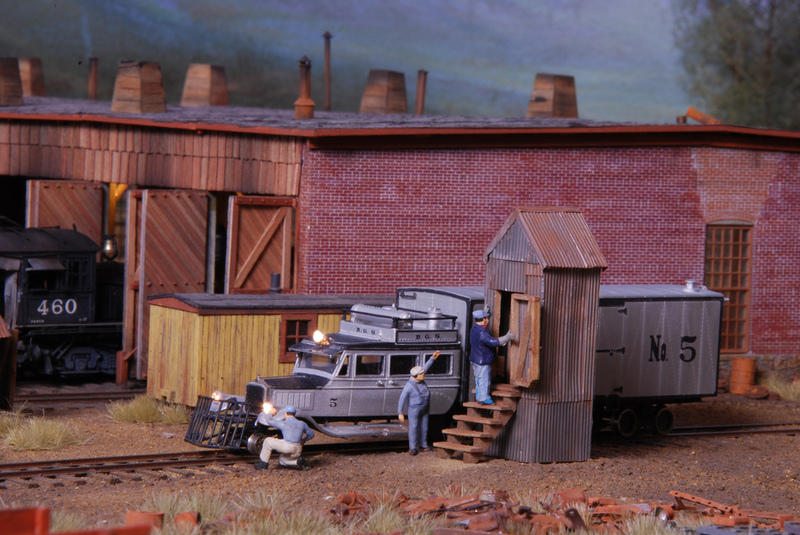 New molds capture every fine detail of the original wall patterns with improvements and updates including laser-cut roof panels, engine doors and boiler shed, with additional white metal details including roundhouse stoves, with full-sized laser-etched templates to keep everything precise. The drawings are a masterpiece in themselves. 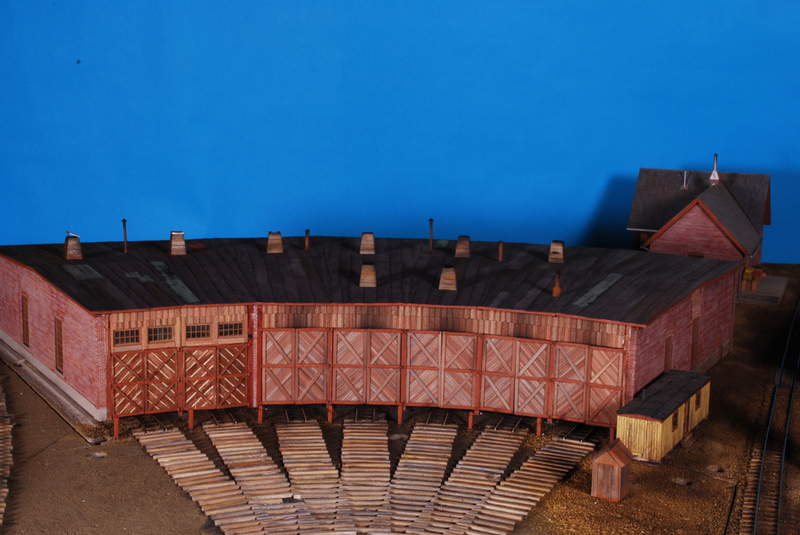 Don't miss this second chance to have a proper roundhouse as the centerpiece of your HOn3 empire. Reserve yours today. Production began end of 2017- and continues slowly due to family medical issues. If you are on the list the original price of $475 honored for those reserved prior to 2018. Brick Office Building kits may be available for $150. 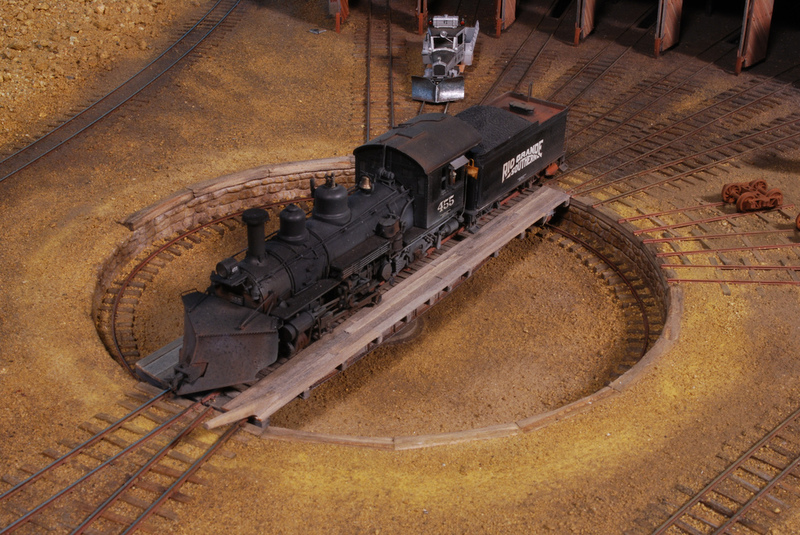 Sorry, turntable is not included, nor locos and yard structures shown below. No deposit necessary, just a firm commitment. E-MAIL if you are interested in being placed on the list. The side walls at 72 feet are slightly longer than the prototype. The engine doors are about 13 feet wide with the stalls spaced at 14 ft. 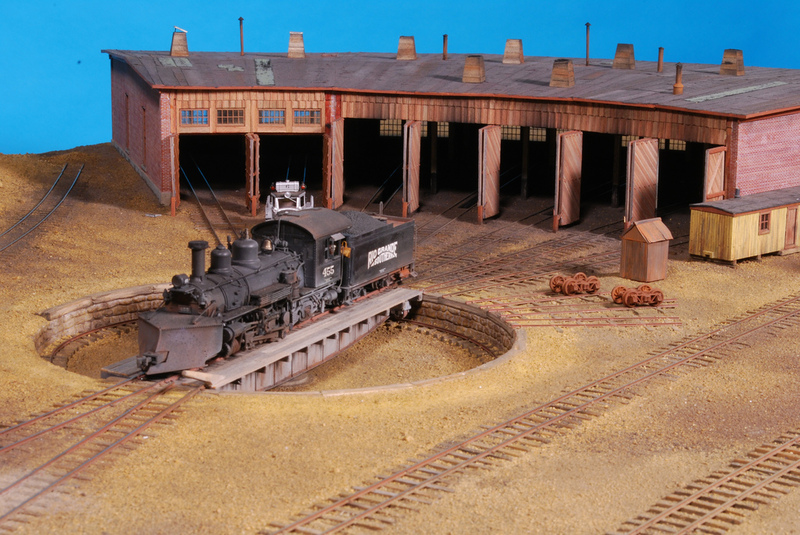 The rear walls are just over 25 ft. Like the prototype the roundhouse kit is designed to fit the smaller RGS locomotives (K-27s). 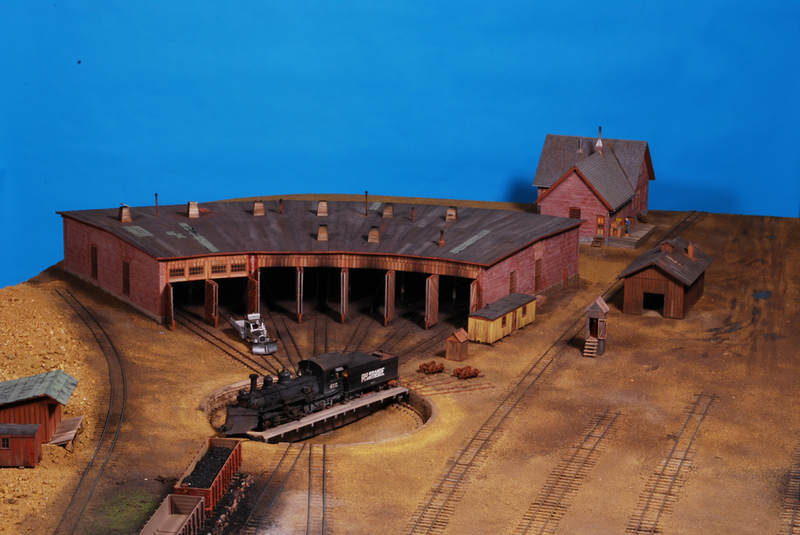 I plan to offer a kit of the larger Durango roundhouse in HO scale but not until I finish producing those remaining reserved in O scale. This may take several more years. 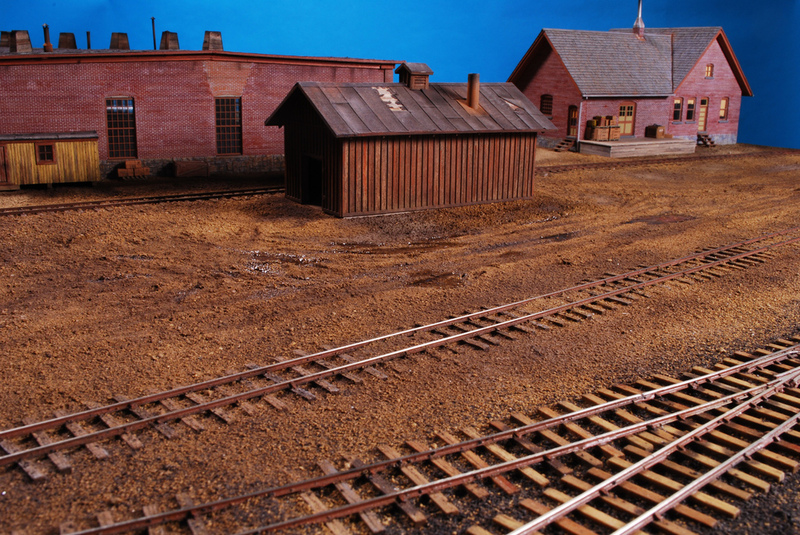 Phil Gazzano's work began with the first run kits and is a highlight on Kevin Shanahan's layout as seen recently in the Narrow Gauge Gazette. These are Kevin's photographs. I know, it's unbelievable. I want this in my basement. Yours too! 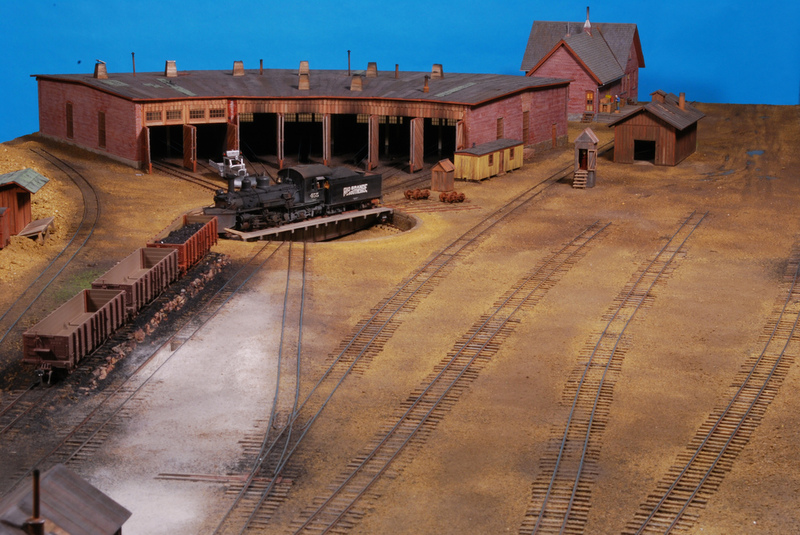 Phil replaced the front facade and engine doors with the beautiful scratchbuilt constrion shown here. We replace the styrene door panels with laser cut wood in the second run kit to suit. 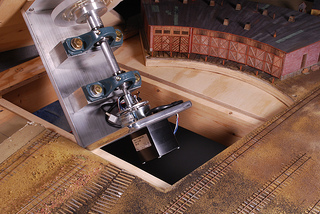 Here's a view of the turntable mechanism showing the axle, bearings and stepper motor. I believe it's construction will be explained in a future Gazette article. The required companion of the Ridgway Roundhouse. is a great introduction to modeling stone in Hydrocal. This is one of my personal favorites, and indeed, over time it's been one of my most popular kits.